Golden Slipper winner Kiamichi (r) and stablemate Microphone (l) will line up in the Sires’ Produce. Trainer James Cummings could have up to five runners in the Sires’ Produce Stakes at Randwick as global operation Godolphin bids to continue its dominance in the juvenile ranks this season. 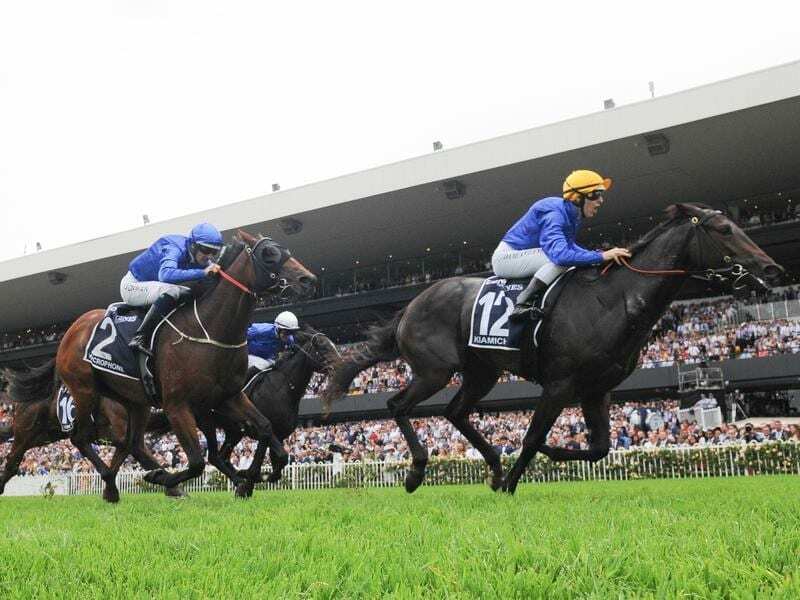 The Anthony Freedman-trained, Godolphin-owned Lyre won Australia’s first Group One race for two-year-olds for the season, the Blue Diamond Stakes in Melbourne in February, before the Cummings-trained Kiamichi led in a Godolphin trifecta in the Golden Slipper at Rosehill last Saturday week. Kiamichi defeated her Cummings-trained stablemate Microphone in the Slipper over 1200m on a heavy track with Lyre taking the minor placing. Kiamichi and Microphone are in line to run in Saturday’s Group One Sires’ Produce Stakes (1400m) at Randwick, the third of five Group One races in Australia for two-year-olds each season. Microphone is on the second line of early betting at $7 behind the Richard Litt-trained Castelvecchio at $6 ahead of acceptances. Cummings seems certain to have a strong hand on the opening day of The Championships which features four Group One races, with Osborne Bulls equal favourite for the $2.5 million TJ Smith Stakes while Alizee and Hartnell are among the leading chances for the $3 million Doncaster Mile. The trainer will also have Aramayo and Cossetot in the Australian Derby.